Tomato confit, or roasted tomatoes, is a beloved classic. Versions abound, from Alain Ducasse’s to Emeril’s favorite, by Daniel Boulud. The secret is in a) the quality of the ingredients, and b) the slow roasting. Roasting tomatoes does wonders for their flavor, simultaneously intensifying and softening it until, well, magic. The following recipe is adapted from Simple to Spectacular , by Jean-Georges Vongerichten and Mark Bittman. Serves 4 to 6. 2. Cut out tomato core and cut an X into the smooth end. Drop tomatoes in boiling water for about 15-20 seconds, or until the skin loosens, then transfer to a bowl of ice water. Peel tomatoes, cut in half lengthwise, then scoop out seeds and pulp. 3. Line a baking sheet with aluminum foil, and place tomatoes cut side down onto sheet. 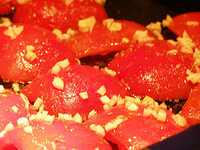 Cover tomatoes with olive oil, then sprinkle evenly with the garlic, thyme and salt. 4. Place in oven and cook for two hours or more, turning both the tomatoes and the baking sheet every 30 minutes. Serve with French bread. *original recipe calls for 12 plum tomatoes OR 6 large tomatoes, 6 cloves of garlic, peeled and lightly crushed, 6 sprigs thyme, and 1 tsp coarse salt. I tried this recipe and the flavor is unbelievable! Delicious and unlike anything else. The hardest part is waiting for them to be ready, because the aroma as they are cooking is almost as good as the final product. These tomatoes are magic, and you know that they are good for you. Great recipe!